London: Oil prices, which hit record highs above $147 (Rs7,041.30 at today’s rate) a barrel this year before plunging under $33, risk slumping more in 2009 as recession curbs world’s appetite for energy, analysts say. Oil prices have tumbled by about 57% since the start of 2008 when they traded at about $95 per barrel. The market had doubled in value over the course of 2007 from a low point of just under $50 per barrel. “By the end of the second quarter, we expect prices should stabilize and find a floor, provided Opec (Organization of the Petroleum Exporting Countries) can comply with their recent cuts and continue cutting output." The crude market plunged in late December to reach the lowest points for almost five years as weak economic data around the world stoked concerns. Opec oil producers’ cartel, which pumps 40% of the world’s crude, is keen to prevent prices sliding further, as member nations look to protect their incomes. But, Opec cuts agreed to in September, October and December have failed to stop the market sliding under $33 earlier this month. “Heading into 2009, we believe many commodity prices are set to overshoot to the downside in response to the worst downturn in economic activity since the Great Depression," added Deutsche Bank analyst Michael Lewis. The market scaled record heights earlier this year on supply worries in key producing nations, sparking fears about runaway inflation globally. But economists now fear that a plunging crude market will spark deflation—a prolonged drop in prices—that will further damage a global economy that is reeling from the impact of a credit crunch. Peter Beutel, analyst at energy consultancy Cameron Hanover said “2008 will go down as one of the most volatile and difficult years, ever" for oil. “It was a year that started with runaway prices and all the makings of the worst inflation in nearly three decades. It is ending with imploding deflation and the worst recession in seven decades," he added. The market has plunged by as much as 78% since hitting record heights five months ago, as traders fretted about global recession—defined as two straight quarters of negative growth. Recession has so far infected the Eurozone, Japan and the US, while even Asian powerhouse China is experiencing slower growth as a global crisis takes its toll. The oil market began 2008 by vaulting above $100 a barrel for the first time. Prices hurtled past $100 on 2 January as traders fretted over violence in Nigeria, and supply problems in key US market. The assassination of former Pakistani leader Benazir Bhutto in 2007 also stoked geopolitical jitters. The market set historic highs on 11 July as traders seized on simmering geopolitical tensions in Iran and Nigeria. That day, New York crude struck $147.27 a barrel and London Brent touched $147.50. Since then, crude futures have plummeted by about $114 to below $33 a barrel in New York in December. 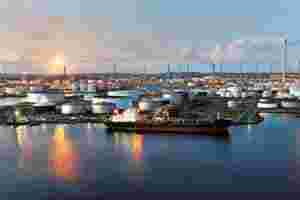 London’s Brent North Sea crude for February delivery traded at under $37 a barrel last week. US investment bank Merrill Lynch forecasts oil prices to average $50 a barrel in 2009, while Deutsche Bank predicts prices to average $47.50,cutting its previous forecast of $60.